DECIPHERING AND IDENTIFYING THE ANCIENT TURANIAN MONUMENTS IDENTIFIED AS "SPHINX"
A sphinx of the ancient world is personified as a mythical creature with the body of a lion and a human head. The most famous sphinx is the Great Sphinx at Gizah, Egypt, near the Great Pyramids of Gizah. Sphinxes can be with male or female heads. In ancient Egypt (Masar / Misir), the sphinxes were regarded as mythological benevolent beings with great strength. They were used as guardians of temples and flanked the gates of temples. The sphinx having the head of a man is called Androsphinges (Androsphinx) in Greek. In Greek mythology, the ram-headed sphinxes are called criosphinxes, and the bird-headed ones are called hierocosphinxes. Egyptian, a mythical creature with the body of a lion and a male human or an animal head, represented in colossal statues as a combined image of the sun-god RA and a pharaoh. The most famous of the sphinxes is the great Sphinx at Gizeh, sculptured from solid rock during the Old Kingdom period. It is in a couchant position and bears the headdress of a pharaoh. Excavations brought to light a small temple standing between the two forelegs. Avenues of sphinxes were used as approaches to temples and tombs in the belief that these creatures would act as invincible guardians. Thus, we see that the most famed Great Sphinx of ancient Masar (Misir) personified the sun-god RA and a pharaoh. I also believe that it also personified the "human head" as a creator deity on earth. The Latin name SPHINX or SPHINKIS or SPHINGIS is described as "a female monster at Thebes having woman's head and lions body", [Cassell's Compact Latin-English and English-Latin Dictionary, 1962, p. 236]. The letter X is a symbol that replaces any one of the letter combinations of KIS, KES, KAS, KOS or KUS as seen in the name SPHINKIS, or GIS, GES, GAS, GOS or GUS as seen in the name SPHINGIS. These Latin terms, contrary to known misleading information, are words that have been made up from the altered forms of Turkish words or sayings that are descriptive of the concept of "sphinx". Therefore, by deciphering these terms, we can recover the descriptive meanings in Turkish. In this regard, let us examine in detail the constitution of the term SPHINGIS. First, let us understand the Latin term Sphingis with a woman's head and lions body. The Latin name SPHINGIS, rearranged (deciphered) as "PSHIN-GIS", reveals that the name SPHINGIS is the altered and restructured form of the Turkish expression "BAŞIN GIZ" meaning "your head is girl" or alternatively "GIZIN BAŞI" meaning "head of a girl" - which accurately describes that the head of the sphinx is that of a girl. This decipherment provides only a description of the head of the sphinx. Alternatively, when the the Latin name SPHINGIS is rearranged as "SN-PISHIG", it reveals that the name SPHINGIS is the altered and restructured form of the Turkish expression "SeN PİŞİG" (SEN PİŞİK) meaning "you are cat" which also accurately describes the body of the SPHINX (SPHINGIS) being that of a cat. Thus, these two decipherments combined together make "PİŞİK KIZ" meaning "cat girl" - which correctly describes the concept of the sphinx as having the a head of a girl and the body of a cat - as described in the above references. Turkish word BAŞ means "head", BAŞIN means "your head", GIZ (KIZ) means "girl", PİŞİK (PİŞİG, PİSİG , PİSİK; KEDİ) means "cat", SEN means "you". All big cats such as lions and tigers are cats but they are larger in size than house cats. Furthermore, in Turkish there is the so-called "Persian" word "PİŞKADEM" meanıng "leader; deputy leader", [Redhouse Yeni Türkçe-İngilizce Sözlük, 1987, s. 936]. This Persian word is none other than the altered form of the Turkish saying PİŞİK-ADAM (ARSLAN-ADAM, BAŞADAM) meaning "leader man, ruler man". So, we see that the Turkish word PİŞİK (also known as KEDİ) meaning "cat" has been a Turkish word at least since the time of the ancient Masarians (Misir), although it has been denied to the world. The saying PİŞİK-ADAM can also be read as Turkish saying "aPa IŞIK ADAM" meanıng "Father Light Man, enlightened man, experienced man". This again describes the Sphinx concept. Figure 1. An example of SPHINGIS with a "girl head and a lion body". SPHINGIS is a restructured word made from the Turkish saying "PİŞİK-GIZ" meaning "CAT GIRL". It is also shown with wings which are one of the features of a sphinx. We are told that, mythically, the term Sphinx also personifies the Sun and the Sun God. Let us examine the Latin word SPHINGIS in this context. When the the Latin name SPHINGIS is deciphered as "GINISH-PS" or "GINIS-PSH", it reveals that the Latin name SPHINGIS also has embedded in it the altered and restructured form of the Turkish saying "GÜNEŞ BAŞ" meaning "sun head" which describes the head of the sphinx as being a personification of the Sun-God of the ancient Turanians. Turkish word GÜNEŞ means "sun", BAŞ means "head". Additionally, when this Latin term SPHINGIS is deciphered as "PSHIN-ISG" or "PSN-ISHIG", it then reveals that the Latin name SPHINGIS also has embedded in it the altered and restructured form of the Turkish saying "BAŞIN IŞIK" meaning "your head is light" which describes the glowing fire of the sun and its light that lights up all objects within its nearby space. Thus, the head of the sphinx also personifies the sun and its ever illuminating light. The Great Sphingis at Giza, Misir (Masar) is a very ancient Turanian monument that the ancient Turanian Tur/Turk/Oguz people erected for the Sun that they worshipped. The ancient Turanians regarded the sun as a) "O KÖZ" meaning "that glowing fire"; b) "O GÖZ" meaning "that Eye " - referring to the Sun as being the glowing and shining "fire eye of the Sky-God"; and c) "OKUZ" meaning "Bull OGUZ" - referring to the Sun God as a mythical Bull-God. Figure 2, Great Sphingis at Giza in MISIR (MASAR). the sky behind the Great Sphinx of Oğuz. But, we must also note that, like the sun and its illuminating light, the human head, with its power to collect and create knowledge, and with its power to share that knowledge using its speech capability, and with its power to imagine and invent abstract concepts and convert them to working and functioning objects and systems, was also regarded as a creator god by the ancient Turanians. They understood that the human head can enlighten other human beings so they likened it to the sun. Thus, the head of the Sphinx also represents the "head of Bilgamesh man". A Bilgamesh man, that is, man with knowledge, wisdom and foresight enlightens all those around him and his horizon. Thus, he/she is a sun-like being in his/her own right. It can be said that the human mind, which has regarded the sun as an illuminating sky-deity", was also at the center of that religion. After all, it was the human head that first conceived the idea that the Sun was our Creator God and that the Sun was the illuminating fire-eye of a supreme Sky God. Turkish word IŞIK (IŞIG) means "light", BİLGEMİŞ (BİLGAMESH, which has the Semitized form of "GILGAMESH" meaning "he/she who is with knowledge, wisdom and foresight"). Polat Kaya: Another aspect is that the Sphinx also personifies the rulers of ancient Masar (Misir, "Egypt"), that is, the Peru or the so-called "Pharaoh". The ruler PERU regarded himself as the "Sky-God", the Sun-God and/or the Moon-God. Even the title name "PERU" is the Turkish saying "BİR O" meaning "PEERLESS" and referring to the Sky-God - indicating that "He/She is the only God". Turkish word BİR means "ONE" and O is the name of the personal pronoun for the third person singular meaning "he/she/it". Thus, the sky deity is addressed in this fashion referring to God as "O". Figure 4. The sphinx of the Queen Pharaoh "HATSHEPSUT". Here we have a female Peru (Pharaoh) ruler of ancient Masar (Misir) - so-called Queen Pharaoh "HATSHEPSUT". She ruled ancient Masar (Misir), some 3500 years ago. Yet the name of this fantastic person of history is insistently mispresented by historians although they say that she was also known by the name HATCHEPSUT. The title name HATSHEPSUT is a rather misleading form of the name. The secondary form of the name HATCHEPSUT, when rearranged as "HATCHE-PSTU" or "HATCE-PSHTU", is the altered form of the Turkish expression "HATİÇE BAŞTU" meaning "Hatiçe is the head" which describes her as the head of the country, that is, she was the female Peru (Pharaoh) for some 20 plus years. Additionally, when the name HATCHEPSUT is read as "HATCHE-PSHTU", then, it is also the altered form of the Turkish saying "HATİÇE BAŞITU" meaning "it is the 'Head of HATIÇE' " indicating that this BUST shown in this stone work represents the head of someone called HATİÇE. But HATİCE is a Turkish name for women - indicating that it was a Turkish speaking Turanian civilization . I must note here that the Turkish name PERİ (PERU) is also a girls name and it means "fairy" indicating beauty. Thus, this decipherment into Turkish not only identifies the true personal name of this very ancient Queen of Masar (Misir) as HATİÇE rather than HATSHEPSUT - which has no apparent meaning, but it also identifies the true identity of the ancient so-called "Egyptian people" as the Turanian Tur/Turk/Oguz peoples - contrary to mountains of disinformation about them. Hiding the true Turanian Turkish identity of these ancient Masarians is an act of pure deception. In other words, it was intentional obliteration of the true Turkish identity of the ancient Masarians by replacing their identity with the term "Egypt". The Turkish people have been subjected to this kind of historical dishonesty for thousands of years. In this case, the name HATİÇE of the Masarian Queen reveals the hidden historical fact that the ancient so-called "Egyptian" state was actually a state of Turkish speaking ancient Turanian Tur/Turk/Oguz peoples before they were renamed as "Egyptians" meaning "gypsies". We see that with the name "HATCHEPSUT" (HATSHEPSUT), not only was the true Turanian Turkish identity of this ancient queen obliterated, but also the identity of this very ancient Turanian Turkish state was usurped, just like the Turkish language was usurped by cabbalist Aryan and Semitic religious groups in the creation of new languages for themselves. So, even in this case, we find that the sphinx of Queen Peru HATİÇE (so-called Pharaoh "HATSHEPSUT") had a female head and a "cat" (PİŞİK) body representation - as shown below. Here, I also want to point out that the English term BUST, French term BUSTE and the Italian term BUSTO, all meaning "a sculpture of a person's head, shoulders, and chest", are the altered and Aryanized forms of the Turkish word BAŞTI meaning "it is the head" or the Turkish word BAŞITI meaning "it is the head of". Thus, these Aryanized terms have also been usurped from the Turkish language. In above descriptions of Sphinx, I explained the different meanings attributed to this ancient name. The fact that we are able to rediscover all this information hidden in old words such as the Latin term SPHINGIS is due to the fact that the ancient world was a Turanian Turkish speaking world and all of these ancient concepts were generated in the Turkish language in Turanian civilization long before the Greeks renamed them with words that were fabricated from Turkish words and expressions by altering and restructuring them into different forms. Those who intentionally confused and changed the Turkish language also fabricated all kinds of black propaganda ways to destroy that ancient Turanian world from inside and out. The artistic and mythological remnants of that ancient Turanian civilization now fill the museums of the world - without mentioning the name TURAN or TUR or TURK or OGUZ people. "What names their builders gave to these statues is not known. At the Great Sphinx site, the inscription on a stele by Thutmose IV in 1400 BCE, lists the names of three aspects of the local sun deity of that period, Khepera–Rê–Atum. The inclusion of these figures in tomb and temple complexes quickly became traditional and many pharaohs had their heads carved atop the guardian statues for their tombs to show their close relationship with the powerful solar deity, Sekhmet, a lioness. Other famous Egyptian sphinxes include one bearing the head of the pharaoh Hatshepsut, with her likeness carved in granite, which is now in the Metropolitan Museum of Art in New York, and the alabaster sphinx of Memphis, Memphis, Egypt, currently located within the open-air museum at that site. The theme was expanded to form great avenues of guardian sphinxes lining the approaches to tombs and temples as well as serving as details atop the posts of flights of stairs to very grand complexes. Nine hundred with ram heads, representing Amon, were built in Thebes, where his cult was strongest. Polat Kaya: The ancient Masarian term KHEPERA-RE-ATUM is actually a descriptive saying in Turkish. It is the ancient Turkish saying "AĞA BİR O ER ATAM" meaning "the only Lord is that God-Man My Father" which refers not only to the Sky-God, Sun-God and Moon-God Oguz who was personified as God with this Turkish expression, but also referred to their ancestor father god. In this Turkish saying, Turkish word AĞA means "ruler, lord; rich man, strong man", BİR means "one", O is the personal pronoun for third person singular and is a name for the Supreme ruler of the Sky-God, ER means "man" and ATAM means "my father; my ancestor". In the old saying, KHEPERA-RE-ATUM, the term KHEPERA is a distortion of the Turkish saying "AĞA BİR O"; RE is a distortion of the Turkish word ER which refers to the Sky God and the Sun-God RE/RA; and the so-called ATUM is the Turkish word ATAM meaning "my father" or "my ancestor". It must be noted that the ancient Turkish saying KHEPERA (AĞA BİR O) used in ancient Misir (Masar) to describe the ancient Turanian Sky-God "AĞA BİR O" was also the godly and kingly title of the man-rulers of ancient Masar, that is, the PERU (BİR O) - (so-called PHARAOH of Egypt). Further it must be noted that this ancient Turkish description of their deities and rulers has also been usurped by Semites and distorted into the name HEBREW . Thus, not only was the ancient Turanian world-wide spoken language of Turkish confused, but also all the Turanian concepts, identities, names and peoples were also stolen. So the ancient Turanian civilization was looted by many unrelated peoples. These non-Turanian people claiming to be HEBREWS, actually sneaked into the shell of the God of the ancient Turanians. HEBREW is a distortion of the ancient Turkish saying AĞA BİR O . We have from Wikipedia the explanation that: "In Ancient Egyptian mythology, a sphinx is a zoomorphic figure, usually depicted as a recumbent lioness or lion with a human head, but occasionally as a lion with the head of a falcon, hawk, or ram. The figure had its origin in the Old Kingdom and is associated with the solardeity Sekhmet. The use of heads of other animals atop the lioness body followed the titular deities of the city or region where they were built or which were prominent in the Egyptian pantheon at the time." "In Egyptian mythology, Sekhmet /ˈsɛkˌmɛt/ or Sachmis (/ˈsækmɨs/; also spelled Sakhmet, Sekhet, or Sakhet, among other spellings) was originally the warrior goddess as well as goddess of healing for Upper Egypt, when the kingdom of Egypt was divided. She is depicted as a lioness, the fiercest hunter known to the Egyptians. It was said that her breath formed the desert. She was seen as the protector of the pharaohs and led them in warfare. Sekhmet's name comes from the Ancient Egyptian word "sekhem" which means "power or might". Sekhmet's name suits her function and means "the (one who is) powerful". She also was given titles such as the "(One) Before Whom Evil Trembles", "Mistress of Dread", "Lady of Slaughter" and "She Who Mauls". She also was seen as a special goddess for women, ruling over their menstruation cycle." http://en.wikipedia.org/wiki/Sekhmet. Figure 6. Sekhmet with head of lioness and a solar disk and uraeus on her head. (a rod or wand borne in the hand as an emblem of regal or imperial power) is pictorially, the Turkish saying, "BİR O" (PERU) - which describes the God or Goddess. When the name SEKHEM is deciphered as "KESHEM", then, it reveals that the name SEKHEM is actually the altered and restructured form of the Turkish saying "GÜŞEM" (GÜCEM) meaning "I am power". So someone again altered this Turkish word (GÜCEM) to make an Aryanized sounding word (SEKHEM). Thus with this decipherment, we see that the name of this solar deity goddess was a personification of POWER - but with the Turkish saying GÜCEM meaning "I am power". Additionally, as she was the solar goddess, when the name SEKHEM is deciphered as "ESHEKM", then, it reveals that the name SEKHEM was also the altered and restructured form of the Turkish saying "IŞIKAM" meaning "I am the light". Of course, the light being referred to here was the light of the sun that lights up the earth. As the above Sphinx drawing of her identity indicates, she is a Sun Headed Goddess, that is, "GÜNEŞ BAŞLI TANRIÇE". The Sun is an immortal and gigantic source of power itself and that is what she is representing. Thus, again we see that this ancient Turanian goddess was named after the sun and sunlight as it was the tradition of the Turanians to do so. And she was deified with the name and light of the Sun-god. As mentioned above she had her origin in the Old Kingdom of ancient Masar (Misir) which was a Turanian kingdom. Furthermore, as she was the solar goddess, in this context, when the name SACHMIS is deciphered as "S-ISHACM", it reveals that the name SACHMIS is actually the altered and restructured form of the Turkish saying "aS IŞIKAM" meaning "I am One light". Turkish word IŞIK means "light" - which itself is energy and thus power. With regards to her identity being a woman, we must note that all of these names SEKHMET, SACHMIS, SAKHMET or SEKHET have the Turkish word KIZ, meaning "girl", embedded in them as "KES" or "CIS". Similarly, with regards to her being a "LIONESS", when the name SEKHMET is deciphered as "SM-KETEH", it reveals that her name SEKHEM also has embedded in it the altered and restructured form of the Turkish saying "İSMİ KEDİ" meaning "her name is cat". This Turkish saying provides her the feature of being a "lioness". Turkish word KEDİ means "cat" and lions are big cats! All of this indicates that, in ancient Masar (so-called "Egypt") the so-called old "Egyptian" names of such goddesses or gods were all based on Turkish language sayings known and used by them - indicating that TURKISH was the spoken language in Masar at that time. To cover this fact up, the Aryan and Semitic clergy readers of these ancient names Aryanized and/or Semitized them - thus erasing the Turkish identity of the Turanian Masars from history. "A sphinx (Greek: Σφίγξ /sphinx/, Bœotian: Φίξ /Phix, Arabic: أبو الهول,) is a mythical creature with, as a minimum, the body of a lion and a human head." Polat Kaya: The first definition give the Greek form of the Sphinx as SPHIGGIS and the Bœotian form as PHIKIS. The Greek form of the term SPHINX is also given as SPHIGGOS [Divry's Modern English-Greek and Greek-English Desk Dictionary, 1988, p. 698]. First, let us examine the ancient name BOEOTIA. The name BOEOTIA deciphered as "BOA-OITE", reveals its source as the Turkish saying "BOĞA ÖYİDİ" meaning "it is the home of BULL" indicating that BOEOTIA was a Turkish speaking part of ancient Greece - contrary to claims that they were Greek or Aryan. Even the modern transliterations VOIOTIA and VIOTIA are concocted names from the name BOEOTIA - where letter B has been replaced with letter V. This is a further act of erasing Turkish traces from history. Its capital city name being Livadeia is also very interesting. The name LIVADEIA, deciphered as "ALEVIDI", reveals that even this ancient name was the Turkish saying "AL EVİDI" meaning "home of Red (God)" indicating that the people were Sun worshipping ALEVI people of Turanian Turkmans; and additionally, it means "it is the home of flame", that is to say, "it was the home of the sun". In other words, this was a city that was named after the Sun and the flames of the sun by the sun worshipping ALEVİ Turks. Even the name of the largest city, THEBES, is from the Turkish saying TEPE (or BAŞTI) meaning "it is the head (city)". THEBES was also called the "seven gated Thebes" - a metaphoric description of the human head - which also has "seven gates". Even the Masarians had a capital city called THEBES. It is said that the Bœotians called the "sphinx" by the name PHIX. But the letter X is a replacement for letters KIS. This changes PHIX into the form PHIKIS. When the Bœotian word PHIKIS is deciphered as "PISHIK", we get the Turkish word "PİŞİK" as its source - and meaning "cat". Thus the Sphinx was a cat based concept. Additionally, when the name PHIKIS is deciphered as "PHI-KIS", it also reveals the Turkish saying "BEY KIZ" meaning "lord girl, goddess girl" which deifies "girlhood". Furthermore, when the name PHIKIS is deciphered as "ISHIK-P", it also reveals the Turkish saying "IŞIK" meaning "light" which refers to the solar light. These findings indicate that Boeotians were Turanians and surely knew how to speak Turkish some 5000 plus years ago. The reference above also states that the term SPHINX come from the Greek word SPHIXIMON which, in my view, has no validity as an etymology and no relation to the concept of "sphinx" or the term SPHIGGOS. The Greek terms SPHIXIMON and SPHIXIS, [Divry's Modern English-Greek and Greek-Engl'sh Desk Dictionary, 1988, p. 698], mean "tightening; squeezing". But that "tightening; squeezing" definition has nothing to do with the etymology of the ancient Greek term SPHIGGOS meaning SPHINX. Although they look similar, they are names for two totally different concepts and thus two different names. Because the X in the Greek term SPHIXIMON is a replacement for the syllable KIS, replacing the X with KIS makes the Greek name SPHIXIMON into SPHIKISIMON. Now, when this name SPHIKISIMON is rearranged as "POIN-SIKMHSI", it reveals that the Greek word SPHIXIMON has been made up from the altered and restructured form of the Turkish saying "BOIN SIKMASI", that is, in modern Turkish, the saying of "BOYUN SIKMASI" meaning "squeezing the neck" or "tightening the neck". Turkish word BOYUN means "neck", and SIKMASI means "squeezing". Thus, this so-called Greek word has been actually usurped from Turkish - and Hellenized. Thus it is very clear that any claim saying that the Greek term SPHIGGOS meaning "sphinx" comes from the Greek word SPHIXIMON - is total misinformation and deception. The Sphinx concept has nothing to do with squeezing or tightening a neck. a) The Greek word SPHIGGOS deciphered as "PISHOG-GS", reveals its source as the the altered and restructured form of the Turkish expression "PİŞÜG GIZ" (PİŞİG-GIZ) meaning "cat-girl". In this decipherment, the Turkish word PİŞİG (PİŞÜG, PİŞİK, PİSİK) means "cat". And GIZ or KIZ means "girl". Thus, again the source of this Greek name is found to be from Turkish. It is known that all "lions" and "tigers" are known as "big cats" and therefore, they are all also called by the Turkish saying "İRİ PİŞİK" since ancient times. Finding, PİŞİG / PİŞİK given to this ancient monument of Sphinx is complete and full proof that not only the ancient Masarians were Turkish speaking Tur/Turk/Oguz peoples, but also that all of these monuments in ancient Misir (Masar, "Egypt") were the creations of ancient Turanian Tur/Turk/Oguz peoples. This all indicates that the ancient world was a Turkish speaking Turanian world. The Sphinx concept used throughout the world is evidence of it! In the above decipherment of the Greek word SPHIGGOS , the -GS component was deciphered as Turkish GIZ meaning "girl". But the the -GS component can also be deciphered as GOS - an anagram that takes place of the Turkish word KOÇ meaning "ram", or the Turkish word KUŞ meaning "bird", or the Turkish word GAZ (KAZ) meaning "goose", or the Turkish word KÖZ meaning "glowing fire", or the Turkish word GÖZ meaning "eye" or even the Turkish word GOZ/GUZ representing the name "Oğuz" which stands for the Sky-God, the Sun-God and the Moon-God - and the Turkish OGUZ people.. In Greek, the final "S" at the end of Greek words is a deceptive symbol which actually replaces the Turkish letters S, Sh (Ş), Ch (Ç), and Z in the original Turkish source text that was used for the manufacture of "Greek" words. b) The Greek name SPHIGGOS, rearranged as "PISG-GOSH" or "PISHG-GOS", is the restructured Turkish expression "PİŞİK-GOÇ" meaning "cat - ram" which is a combination of a cat body and a ram head - as in the picture of an ancient sphinx (SPHIGGOS) shown below. We note that the Kushite sphinx busts are in the form of "ram-headed cats" as shown below. Figure 7. Ancient Masarian (Misir) Ram-headed sphinxes on both sides of a temple road. Turkish word PISIG (PIŞIK) means "cat"; KOÇ (GOÇ, KOCH, KOSH) means "ram" which was a logo of Amun the creator Sky Father God of ancient Masar (MISIR). The so called KUSHITE Pharaohs of ancient Masar particularly favoured the RAM headed and CAT (KEDİ or PİŞİK) bodied sphinxes. But the Turkish word KOÇ (KOCH) was altered into KUSH meaning "birds", and thus, they have been called KUSHANS (KUSHITES) rather than KOCHANS (KOCHITES). With the alterations, the Turkish concept of KOÇ-HAN meaning "Ram Lord" has been distorted into KUŞ-HAN meaning "Bird Lord". However, in either case, these names are also a form of the Turkish saying GOS-HAN and GUS-HAN which are names of OĞUZ HAN. Greek word SPHIGGOS, deciphered as "ISHG-POS-G" is also the Turkish saying "IŞIK BAŞ" which means "light head" or "Sun-Head." Turkish word IŞIK means "light", BAŞ means "head". Polat Kaya: Both names CRIOSPHINXES and HIERACOSPHINXES personify mythological concepts that describe a ram-headed and lion-bodied being, and a hawk-headed and lion-bodied being respectively. The historians and geographers of Greece wrote extensively about Egyptian culture. Herodotus called the ram-headed sphinxes Criosphinxes and called the hawk-headed ones Hieracosphinxes. The word sphinx comes from the Greek Σφίγξ, apparently from the verb σφίγγω (sphíngō), meaning "to squeeze", "to tighten up". This name may be derived from the fact that the hunters for a pride of lions are the lionesses, and kill their prey by strangulation, biting the throat of prey and holding them down until they die. However, the historian Susan Wise Bauer suggests that the word "sphinx" was instead a Greek corruption of the Egyptian name "shesepankh," which meant "living image," and referred rather to the statue of the sphinx, which was carved out of "living rock" (rock that was present at the construction site, not harvested and brought from another location), than to the beast itself. Polat Kaya: First of all, in this etymological source, saying that: "The word sphinx comes from the Greek Σφίγξ, apparently from the verb σφίγγω (sphíngō), meaning "to squeeze", "to tighten up". This name may be derived from the fact that the hunters for a pride of lions are the lionesses, and kill their prey by strangulation, biting the throat of prey and holding them down until they die" is a concocted explanation that has nothing to do with the meaning of SPHINX. It is pure sophistry. Likening the word Sphinx to the so called Greek word σφίγγω (sphíngō), meaning "to squeeze", is misinformation. In other words, it is deception used to cover up the Turanian origin and identity of the Sphinx concept - . Now let us examine the make up of the Greek words CRIOSPHINXES meaning "ram-headed" and HIEROCOSPHINXES meaning "bird-headed". The Greek word CRIOSPHINXES, with the letter X being KES, makes the name CRIOSPHINKESES. When CRIOSPHINKESES is rearranged letter-by-letter as "COSH-PES-KINES-IR", it reveals itself as the anagrammatized form of the Turkish expression "KOÇ-BAŞ GÜNEŞ-ER" meaning "ram-headed sun-man". This verifies that the Greek word CRIOSPHINXES has been made up from a Turkish saying that describes a "ram headed" sphinx concept. Additionally, when the name CRIOSPHINKESES is rearranged letter-by-letter as "PISHIK-CONESS-ER", it also reveals that it is an Aryanized form of the Turkish expression"PİŞİK GÜNEŞ ER" meaning "cat sun-man". Thus, it verifies that it is also cat (that is, a lion) bodied and a sun believing-man headed sphinx concept. 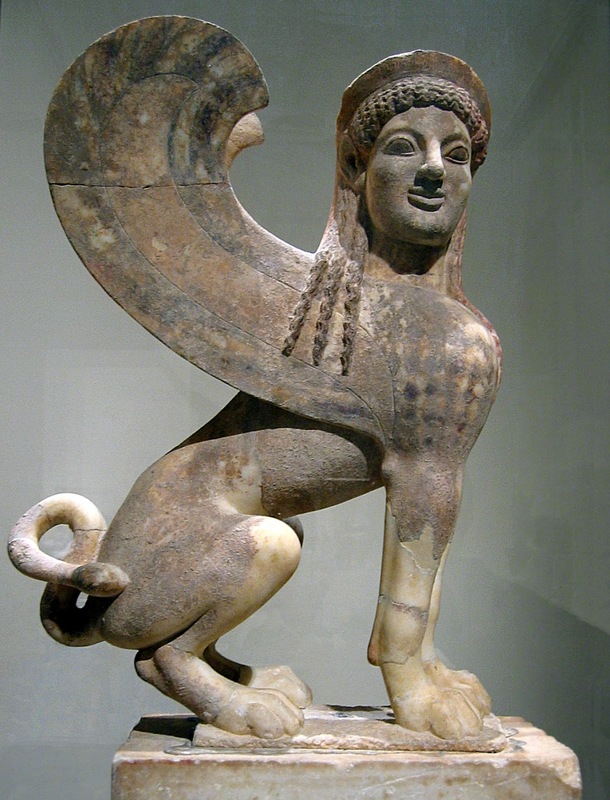 Thus, the Greek word CRIOSPHINXES has both of the Turkish sayings "KOÇ-BAŞ GÜNEŞ-ER" and "PİŞİK GÜNEŞ ER" both which together make up a "ram-headed - cat bodied sun-man" sphinx concept. A ram-headed and lion bodied sphinx , protecting-a-man, is given in the picture below. Turkish word KOÇ (KOCH, KOŞ / KOSH)) means "ram", BAŞ means "head", GÜNEŞ (KÜN, KON, KİN) means "sun", ER means "man, soldier, hero, husband" and PİŞİK (PİSİK) means "cat". This clearly shows that the Greek word has been restructured from an ancient Turkish expression defining the "sphinx". Thus, it is clear that the term "sphinxs" is a personification of the Sun-God in terms of some pictorial representation. But pictorially, a sphinx also has the body of a lion or cat and the head of a ram or bird or woman or man. In ancient Masar (so-called "Egypt"), the Turkish names KOÇ, KUŞ, KUZ (KUZU), OKUZ are the representations of the God OGUZ of ancient Turanians. "Scholars" have distorted this ancient Turkish word KOÇ (meaning "ram") into KUSH - meaning "bird". The Nubian people who were the rulers of Masar for a period of time (between 747 - 646 BC) and whose symbol was the ram-headed sphinx, have been wrongly called KUSHITES. Figure 8. This is a Masarian (MISIR) Ram (KOÇ) headed sphinx statue. From Temple T at Kawa, Sudan 25th Dynasty, 690-664 BC. The statue is a sphinx, representing here the immense power of the Egyptian and Kushite pharaoh Taharqo or Taharka whose face is shown. The headdress bears with two uraei, the symbols of kingship, and Taharqo's name appears in a cartouche on the sphinx's chest. The statue is called "a masterpiece of Kushite art." The statue was excavated at Temple T, in the area east of the south-eastern part of the Temple of Amun at Kawa (now Gematon), in Nubia (now Sudan), during excavations there by the Archaeological Mission of the University of Oxford during the 1930s. Construction of the stone temple was started in 683 BC by Taharqo. Polat Kaya: STATUE is a sphinx made from stone. In this context, when the term STATUE is deciphered as "TASTE-U", it reveals its linguistic source as being the altered form of the Turkish saying "TAŞTI O" meanıng "it is stone". Turkish word TAŞ means "stone", TAŞTI means "is stone" and TAŞTI O means "it is stone". The Greek word HIEROCOSPHINXES, with letter X being KES, makes the name to be HIEROCOSPHINKESES. When HIEROCOSPHINKESES is rearranged letter-by-letter as "SEN-O-COSH-PISHIK-ERE", it reveals itself as the anagrammatized form of the Turkish expression "SEN O KUŞ-PİŞİK ERİ" meaning "you are that bird-headed cat-man". Figure 10. The Hieracosphinx has the head of a hawk and the body of a lion. When the the Greek name ANDROSPHINGES is deciphered as "DANRI-GONESH-PS", then, it reveals that the Greek name ANDROSPHINGES is the altered and restructured form of the Turkish saying "TANRI GÜNEŞ BAŞ" meaning "God-sun head" - which describes the person shown in the head of the sphinx as being a personification of the Sun-God of the ancient Turanians. This again shows that this so-called Greek term is none other than the alteration and rearrangement of the Turkish saying "TANRI GÜNEŞ BAŞ" indicating that ancient Greeks knew the Turkish language (which was spoken world wide) very well despite their denials. Turkish word TANRI means "god". It is interesting to note that Greeks have changed this Turkish word TANRI into ANDRO or ANDRAS meaning "man". Furthermore it is important to note that the rulers of ancient Masar called themselves by the Turkish title PERU (meaning "one" or "single" or "only" or "peerless") which was a Turkish name of God. Thus, each Peru was deified as GOD. The Sphinx made for each Peru personified that Peru as a god-man. Additionally, when the name HIEROCOSPHINKESES is rearranged letter-by-letter as "PISHIK-CONESH-OS-ERE", it reveals itself as the anagrammatized form of the Turkish expression"PİŞİK-GÜNEŞ OĞUZ ERİ" meaning "cat-sun-god Oguz man". Thus, in the same word, the name of sun in Turkish, that is, "GÜNEŞ", and the name OĞUZ are also embedded in this Greek name. "What animal walks on four feet in the morning, on two at noon, and on three in the evening?" Turkish professor Ilhan Bashgöz writes about this riddle in his book about Turkish Riddles entitled: "Türk Bilmeceleri" volume 2, Kültür Bakanligi Basvuru Kitaplari, Ankara, 1993, s. 618, Bilmece No. 939. In his 2 volume work, it is most interesting to find that this "Sphinx" riddle is reported with six different versions in Turkish as a Turkish riddle among some 14,000 Turkish riddles that Prof. Ilhan Basgöz has reported. I can say with confidence that some six thousand years ago, this riddle was Turkish and it is still presently Turkish. In conclusion, I noted in this writing that the concept of SPHINX was a cultural import into Greek mythology - and thus was not their culture. Although it is said that it was invented by the old "Egyptians", the truth is that the so-called "old-Egyptians" were actually the old Turanian Tur/Turk/Oguz peoples. Hence, the source of the concept and the names were from the Turkish speaking Turanian people. Those who usurped this ancient culture of the Turanian TUR/TURK/OGUZ people - elevated themselves undeservingly and thus misled the world. They renamed ancient MASAR (MISIR ) as "EGYPT" meaning "gypsy". Replacing the ancient Turanian Tur/Turk/Oguz names and identities with the alienated identities of the Aryans and Semites was an evil act of intentional confusion. Replacing the old Turkish names with Aryan/Semitic names achieved at least two things: 1) it transferred all of the ancient Turanian cultural achievements (such as reading, writing, education, agriculture, shipbuilding and navigation, and many others) to Gypsies; and 2) it erased the Turanian history from history. Yet the ancient Turanians of so-called "Egypt" were not gypsies. They were the builders of unmovable and everlasting pyramids and Sphinxes.